People who don’t sail or voyage by boat are often very amazed when they hear of cruisers who go offshore for a year…or several. Their minds conjure up “The Perfect Storm” (which is actually a rare occurrence), and they think that you are doing something very brave. 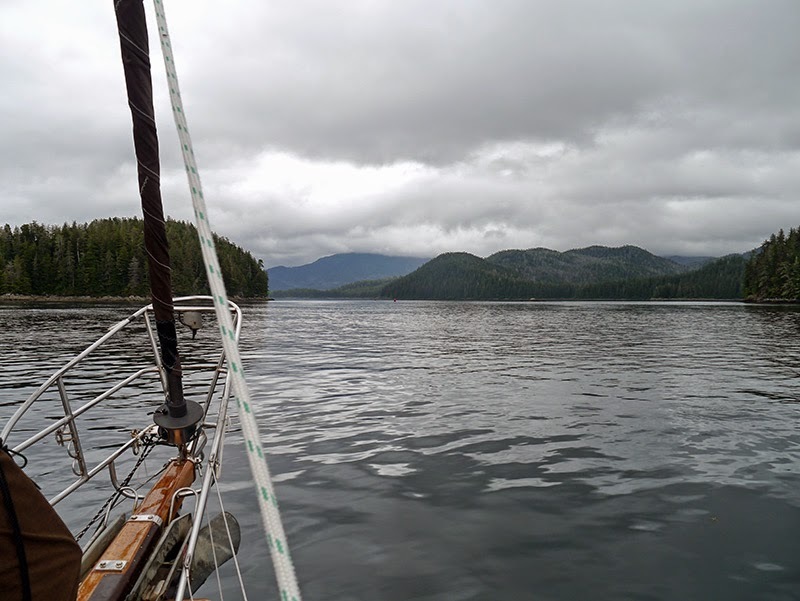 Our trip through Southeast Alaska and British Columbia brought home a fact oft-expressed by sailors: It is much more dangerous being close to land than on the open ocean. Sometimes channel markers are put on rocks, which also serve to mark the hazard. In addition to the land itself (rocks and reefs), here are some of the many other navigation challenges we encountered when cruising above 50 degrees North. 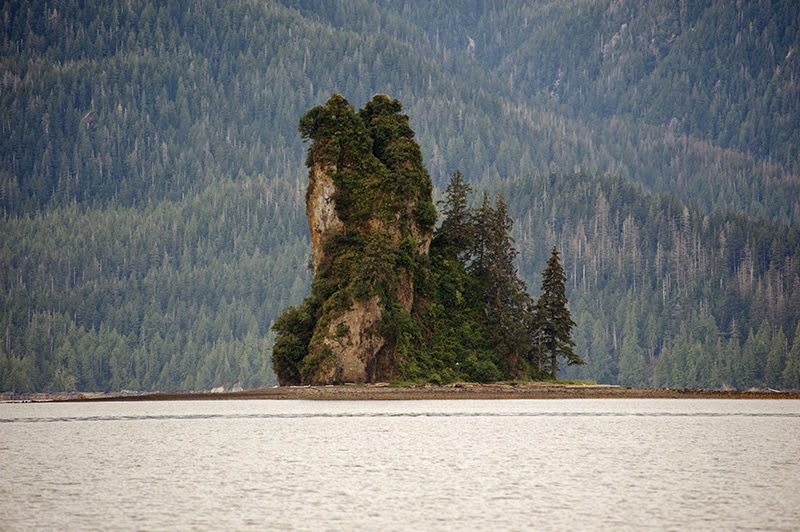 While these navigation challenges are by no means unique to SE Alaska and British Columbia, I would say that some of them are encountered more frequently there. Containers and vehicles falling off a tow are potential hazards but rare compared to containers falling off of cargo ships at sea. Icebergs: Unique to regions where glaciers are found, icebergs can be encountered many miles from the glacier from which they were calved. The most insidious icebergs are also the oldest: The ice in them is so compressed, with very few air bubbles left inside it, that the ice is almost clear. These icebergs take on the color of the water and are very difficult to spot ahead of time. A clear iceberg in Tracy Arm...cocktails, anyone? Narrows and Rapids: Narrows are areas of deep, navigable water with shallow depths or simply shorelines/banks on either side. Narrows in and of themselves are not that dangerous, as long as you stay within the channel, but when combined with current (ebb and flood tides) or opposing traffic, they can be tricky or dangerous. 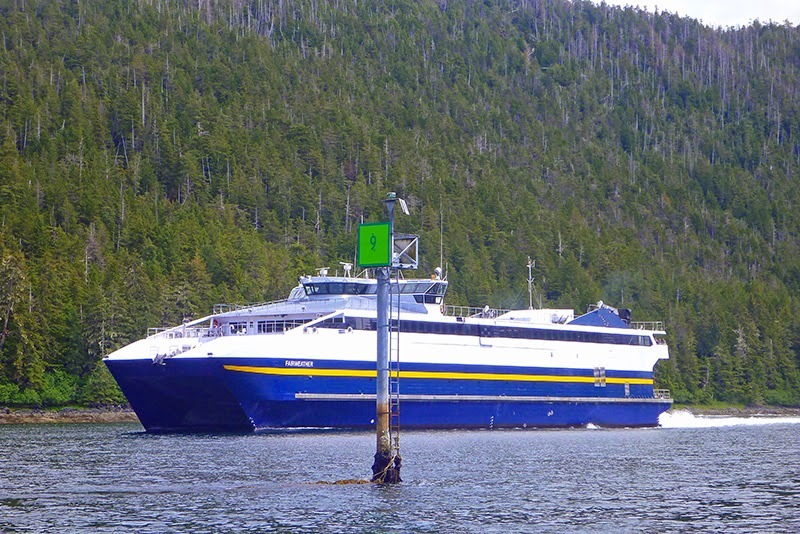 For this reason, most large vessels give a "Securite" call when entering a narrows that goes something like this: "Securite, Securite, high speed ferry Fairweather entering Sergius Narrows in five minutes, westbound, concerned or opposing traffic call on 16 or 13. Fairweather standing by on one-six and one-three." Most vessels wait to go through a narrows if a large vessel has just issued a Securite call. Likewise, most vessels wait until slack water---or at least until after maximum flood or ebb---to transit a narrows. 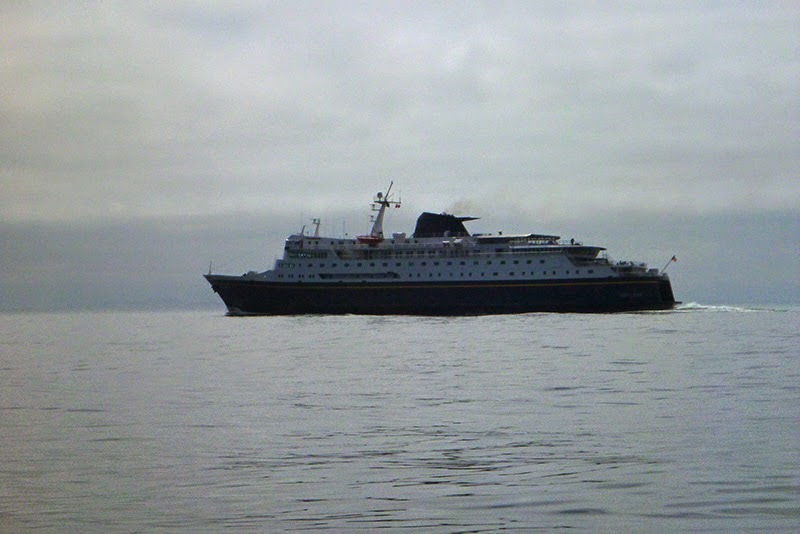 In the picture below, the Fairweather is passing Silhouette in Whitestone Narrows. 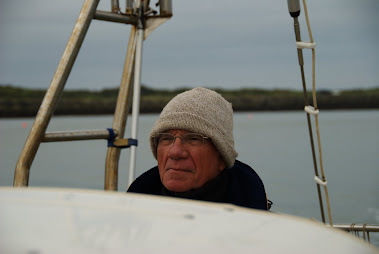 In this case, the Fairweather entered the narrows after Silhouette did, and here, Patrick has actually pulled out of the channel (after first making sure he had sufficient depth) to allow the Fairweather to pass. Silhouette entering Sergius Narrows: The end of the point of land at left (green marker not visible) and the red marker in the channel (barely visible) define the width of the narrows. 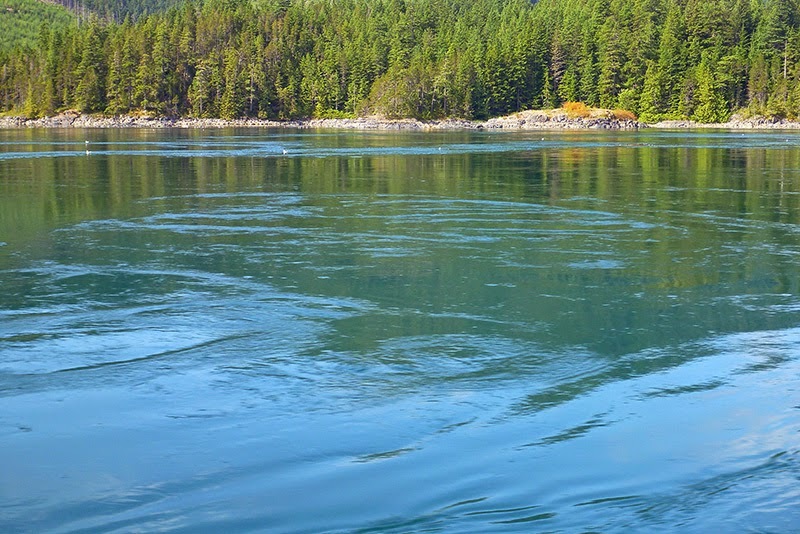 In British Columbia, we exited a narrows (Watts Narrows) with as much current as we saw in some of the passes in the Tuamotus. Watts Narrows, and one other that we encountered---Jackson Narrows---were so slender that even Silhouette gave a Securite call before entering: There simply was not enough room for even two small vessels to pass each other. In addition to narrows, we had to pass through several rapids. Again, we timed our passage through the rapids to coincide with slack water. Fishing gear: Conflict with fishing gear is always a potential problem; in this region where fishing is not only one of the major industries but a way of life, the potential is even greater. 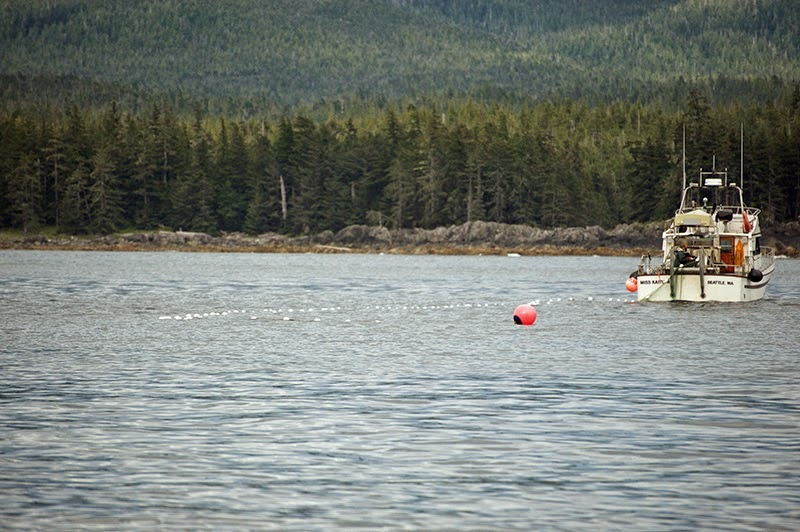 Boats underway must always keep a close lookout for trolling gear, purse seines, gill nets, and crab pot floats. Of these, the most difficult to spot are the crab pot floats and the floats at the end of a gill netter---which can be up to 1/4-mile away from the vessel the net is attached to. 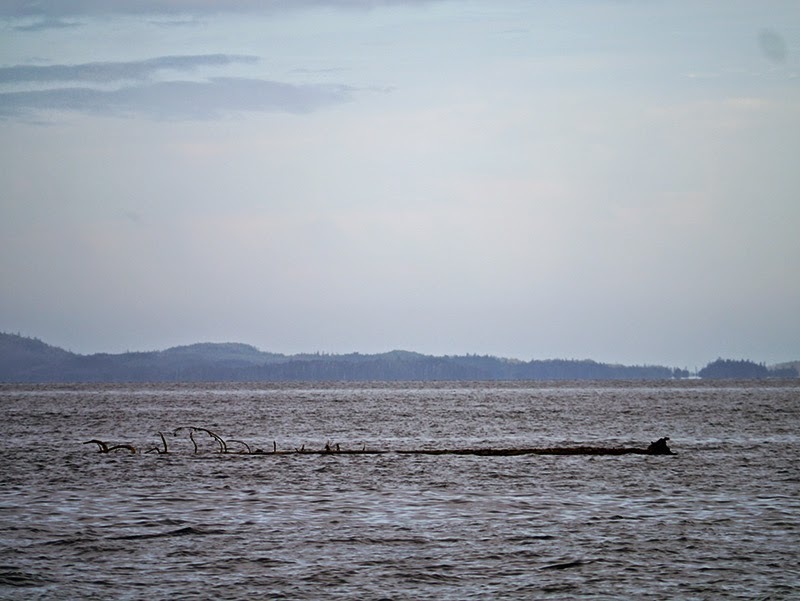 Floating trees, deadheads and logs: Encountering an actual deadhead (a log saturated with water so that it is suspended vertically in the water column) is rare; however, coming across floating logs is not a rare occurrence. 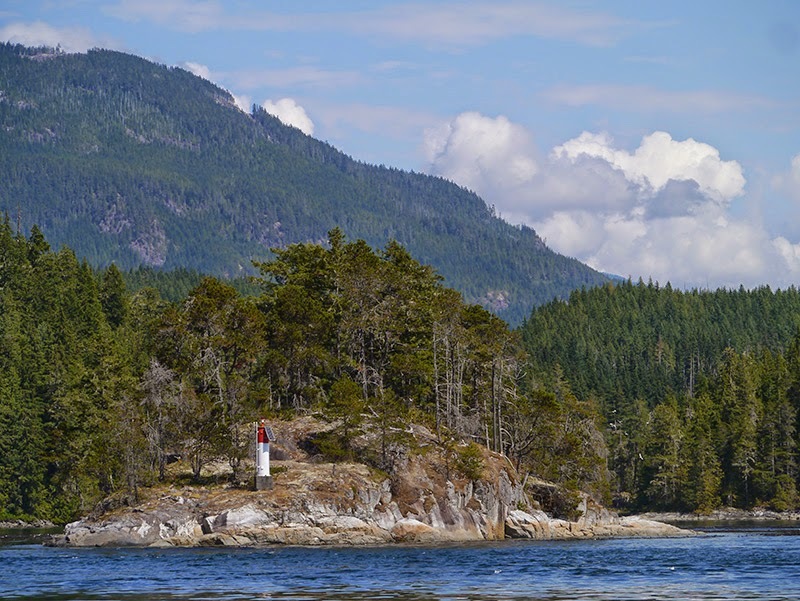 British Columbia has an active logging industry, and escapees (as well as deadfall and windfall from forests) frequently make their way to the beach. During the Spring tides, the highest tides of the month, these logs are carried off the beaches by waves and frequently pop up on your course. We don't have pictures of most of the big logs that we passed, because they were frequently encountered during fog when we were anxiously keeping a watch. Whales: Whales in transit are not a navigation hazard that is unique to the Pacific Northwest; however, there is a large concentration of humpback whales here. 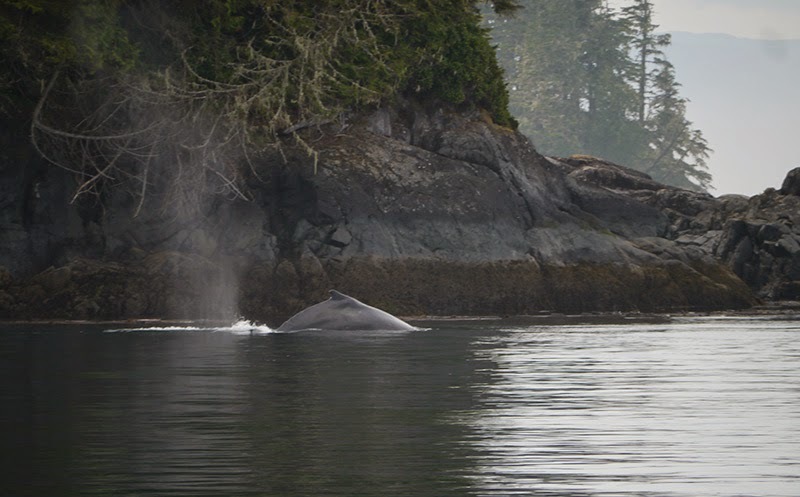 We didn't see any orca on our recent passage, but we expected to in Southern B.C. Flotsam: Occasionally, large pieces of flotsam are also encountered. 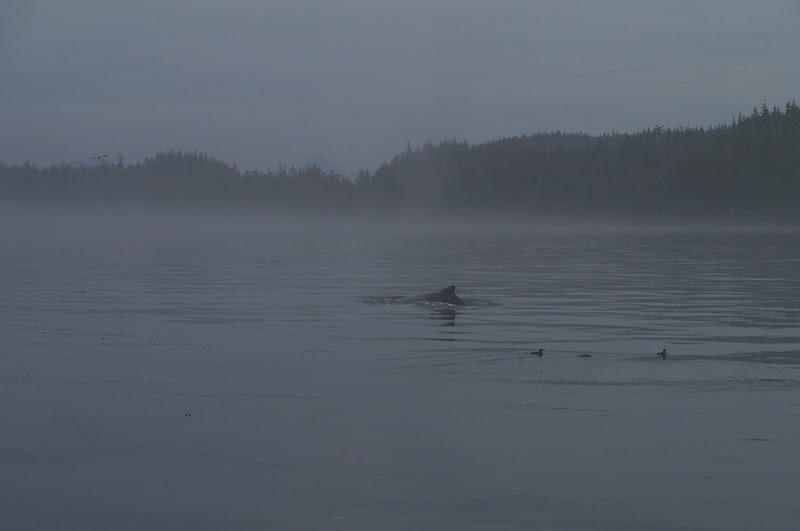 Fog: Fog is perhaps the most difficult of the Pacific Northwest navigation hazards to deal with. While modern day electronics (especially AIS, or Automated Identification System) make things a lot easier than in the past, you still have to look out for those vessels who don’t have AIS in order to avoid a collision. 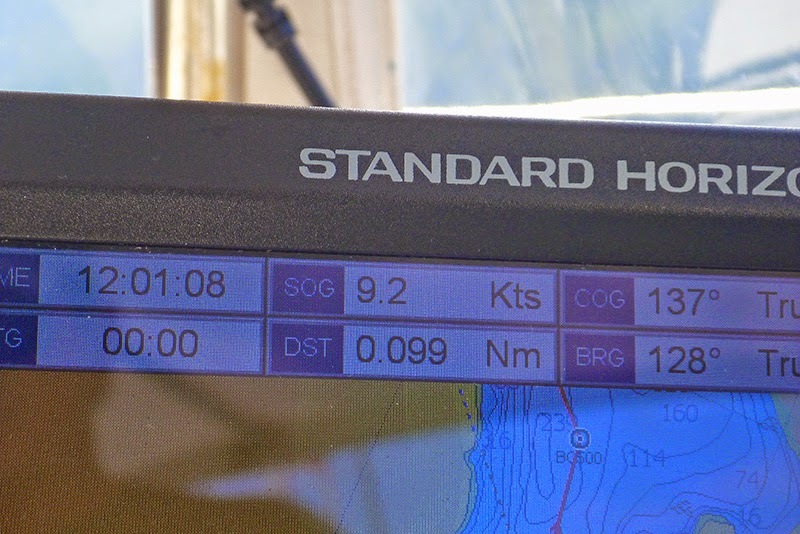 Those vessels with an AIS transponder are shown on your chart plotter with their vessel name and a boat icon. All of the large vessel traffic are required to have AIS by law, so the likelihood of being run down by a cargo ship, oil tanker, or cruise ship is much less than it used to be. 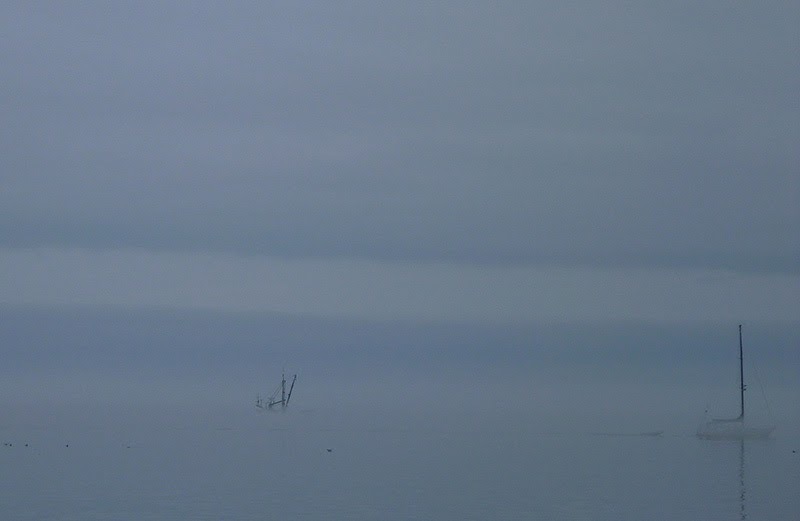 However, collisions with smaller vessels are still possible, and navigation through fog requires manning the radar and keeping a continuous sharp lookout on deck until the fog clears. 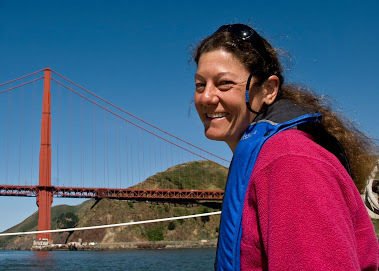 In most cases during our voyage, the fog cleared around noon; but on one memorable day, we navigated through fog from 9:00 a.m. until 4:00 p.m. 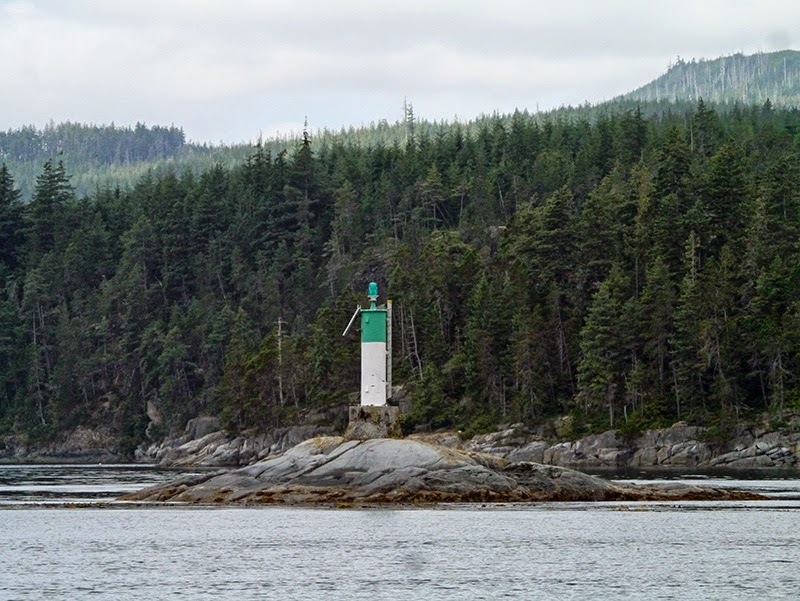 This kind of navigation requires your total concentration and is extremely taxing---especially when you are looking out not only for other vessels, but for floating logs and debris. 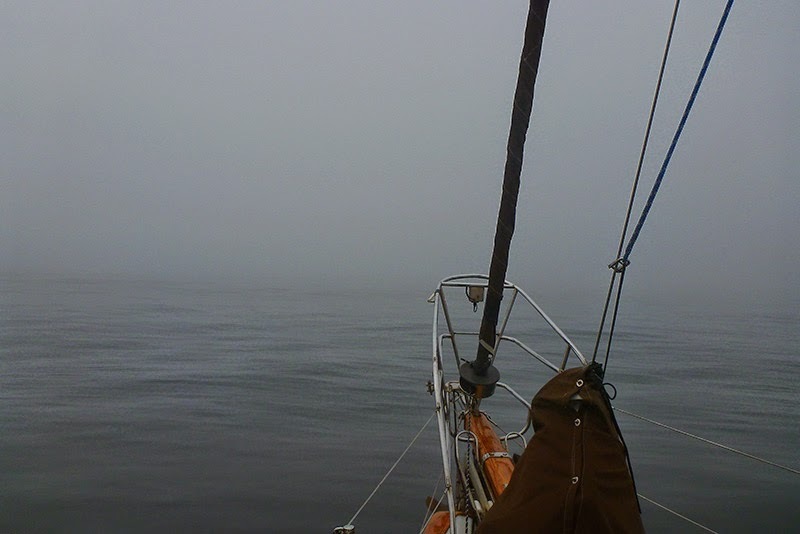 Even in fog, we often had a hundred yards to 1/8-mile visibility; however, when the visibility went down to zero, we started sounding our foghorn at two-minute intervals. Again, we don't have any pictures of the worst conditions we experienced, because we were too busy keeping watch at times of zero visibility. 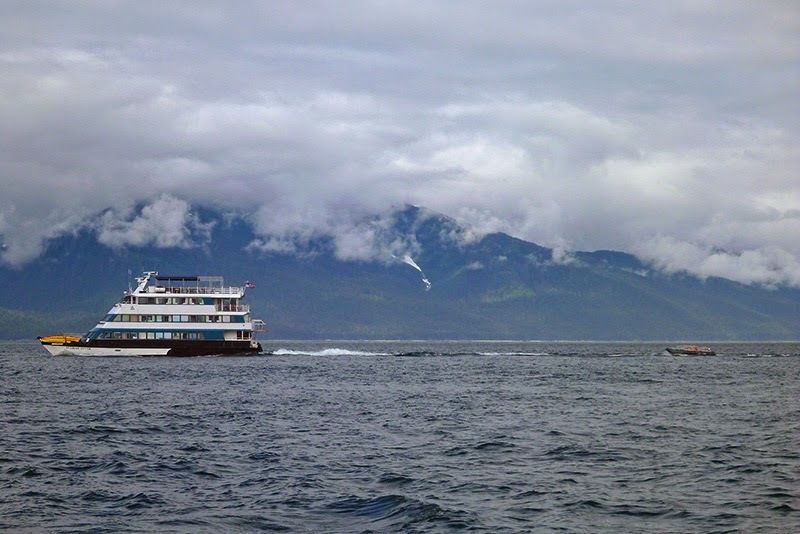 We were thankful that we didn’t travel at night when coastal cruising in Southeast Alaska and British Columbia. We needed to rest our eyes and take a break from the more intensive watch-keeping that cruising those waters requires.